Belle maison de 2200 pieds carrés dans l'ouest de Ketchum. Idéalement situé dans la ville, près de Big Wood River, River Run Lodge, YMCA, Atkinson Park et des pistes cyclables. à la cour et un bain à remous. Cette chambre dispose d'un lit king-size, d'une télévision de 81 cm et d'une salle de bains privative avec douche / baignoire. Deuxième étage dispose d'une cuisine avec coin repas, salle à manger séparée pouvant accueillir 10, une grande chambre avec une grande télévision à écran plat, une chambre avec deux lits superposés et une salle de bains complète avec douche / baignoire. Troisième étage est la chambre des maîtres. Cette chambre dispose d'un lit king size, un bureau, une télévision et une salle de bains privative avec une promenade dans le placard. Le maître de bain a une douche à vapeur. Very clean and NO clutter which we like... Easy place to stay, great layout and we slept great which is always a plus! We will pick this spot again! Absolutely loved our stay here!! The house had a great layout with wonderful areas to hang out but lots of privacy too. The house is in a perfect location, close to everything---beautifully decorated, comfortable and had everything we needed to enjoy our holiday! We especially enjoyed the hot tub and heated floors!! We stayed over Christmas and they even decorated the home with lovely poinsettias, evergreen garland and wreaths! Deide was so helpful and wonderful to deal with too! 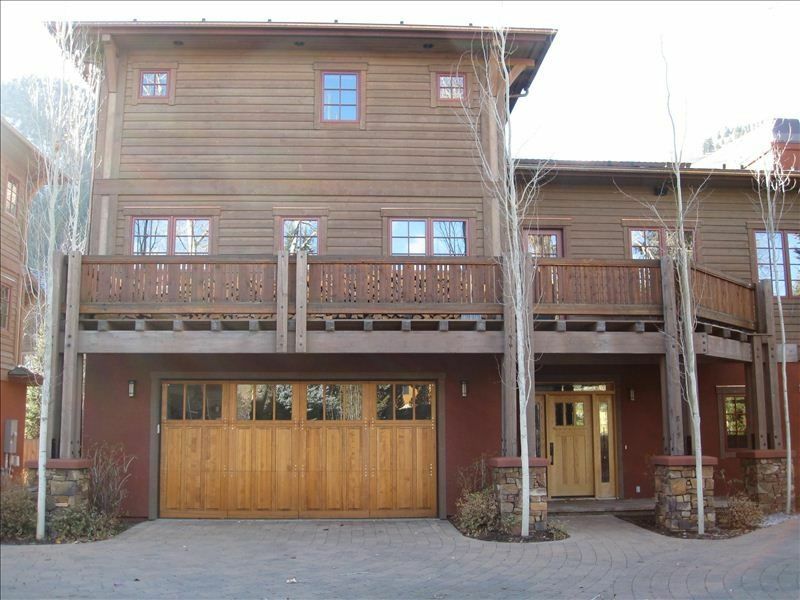 We have been coming to Sun Valley for years and have even owned a condo there but I have to say that this house is everyone's new "favorite"! We will definitely be back!! We had stayed in the sister property a few years ago so knew what to expect from the layout which worked great when traveling with 3 adults and a toddler. Location is superb! Quick walk to town or to the bike path plus you have river access in the neighborhood. Deide was great to work with and left a wonderful welcome treat. Highly recommend this property. This home is in a wonderful neighborhood, walking distance to nearly everything in Ketchum yet tucked away in a quiet neighborhood. My boys loved being so close to the park, the YMCA, the bike path, and the bike park. The home itself has everything you could need and is just beautiful. The owner is very welcoming and attentive. The hot tub was wonderful. I have absolutely nothing negative to say...wish I could live here!! This is such a great house with nice finishes. It fit our group of two couples with a total of four children perfectly. We really enjoyed being able to walk to the playground and into town for dinner. It was also a nice surprise to find bikes in the garage that we used on the nearby bike path. Deide went above and beyond to give recommendations. She even offered to come over to help me figure out how to turn on the TV (user error). I would definitely stay here if I get the chance to return to Ketchum! We loved staying at this wonderful home!!! We loved staying at this wonderful home!!! The rooms are very spacious with lots of natural light. The location is great too: a block away from a great park for kids and very close to the start of the paved bike trail. We had the pleasure of meeting Deide, who manages the property for some family members, and her husband Carlos (original owner) - wonderful people! We highly recommend this cozy home!